Not only do these festive cookies taste delicious but the spice mix will also fill your home with the nostalgic smell of Christmas, and they make a fabulous gift for friends and family too. Preheat the oven to 175°C / Fan 155°C / Gas 5 and line two baking trays with baking paper. Mix baking powder with flour and all the spices and salt in a food processor. Add brown sugar and butter. Add golden syrup and egg to the food processor while it’s still running. Pulse until the mixture stays together. Take the dough out of the food processor and knead briefly with floured hands. Wrap in cling film and refrigerate for approx. 30 mins. Lightly flour a work surface and roll the gingerbread dough to a 0.5cm (. inch) thickness. Cut out the gingerbread with your favourite shapes. Place on a baking tray. 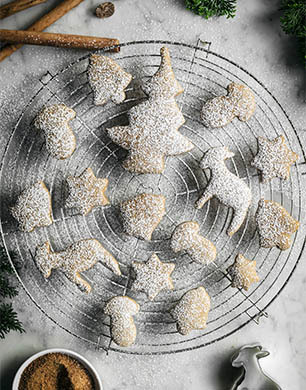 Let the cookies cool down and decorate with icing sugar.